A fish finder is essential to any fishing trip. Whether you’re looking for your favorite fishing hole, or trying out a new place, having a fish finder allows you to locate fish easily. Fish﻿﻿ ﻿﻿finders are perfect for any fishing trip because you can use different models for the type of fishing you’re doing. If you’re thinking about getting the best fish finder under 300, there are some things you should consider. While it may not seem like fish finders need a lot of considerations, you should put some thought into them before getting one. The smallest detail can help you land the perfect fish finder for you and what you want to do. 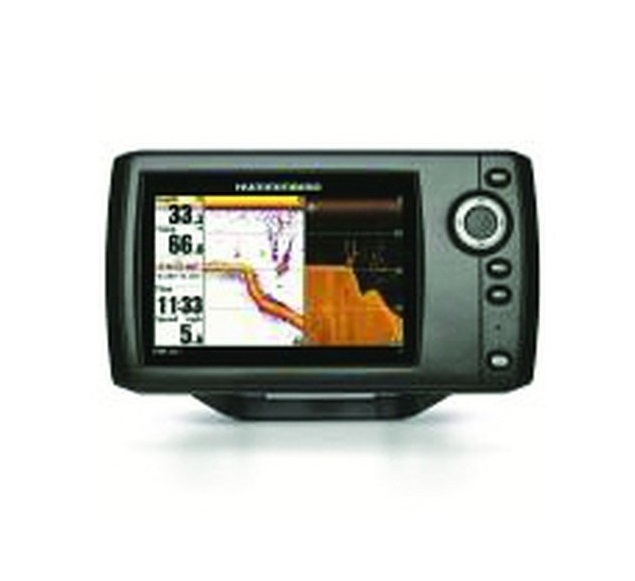 The Helix is a series of trusted fish finding GPS’s from Humminbird. It is one of the most technologically advanced fish finders that you can buy on the market, but is it worth the money? It’s sonar technology, for one, is unprecedented. The CHIRP sonar that is built into this unit can allow you to detect where fish and other life forms are at high, medium and low frequencies. With “Dual Beam” technology, you are able to also scan the water underneath your boat. It’s two beams can help you detect objects more accurately, just like how you need two eyes to see better. It’s technology can also allow you to plan, chart and map efficiently, so you can plan your trip on the water from start to finish. You can save up to over 2700 waypoints among 47 routes and 50 tracks. It’s much like a journal in a sense that it can store information about fish as well as where the fish finder has found it. 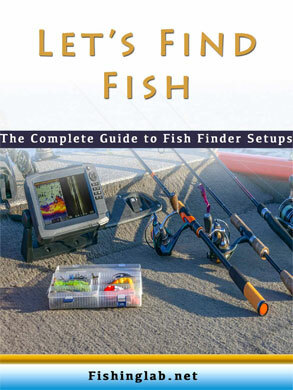 This is also a very easy to use fish finder that you can easily read and understand, as well as where to navigate. The Helix 5, however, does not come with a cover. You will have to buy the cover separately, and for a nice piece of tech like the Helix 5, you would appreciate it coming with some layer of protection, but that is just not the case. An excellent ruggedized case offering from Garmin, the 5DV fishfinder is built to stand up to the toughest of outdoor conditions while maintaining peak performance. The built-in high sensitivity GPS lets you mark the exact coordinates of your favorite fishing spots so you can come back again and again if the fish are biting. Furthermore, it also displays your current trawling speed for your convenience and safety. Another excellent feature is the ability to mark waypoints on your map, helping you avoid stumps, steer around brush piles,and keep track of docks more easily on repeat visits. Best of all though, this fish finder uses CHIRP sonar along multiple frequencies from low to high, adding more information with every sweep. The chief advantage to this active sonar system is that it also lets you generate cleaner fish arches and target individual fish with greater precision. Lastly, the built-in flasher displays sonar data like a classic fish finder, making it ideal for fans of vertical jigging and ice fishing as well as boat fishermen. 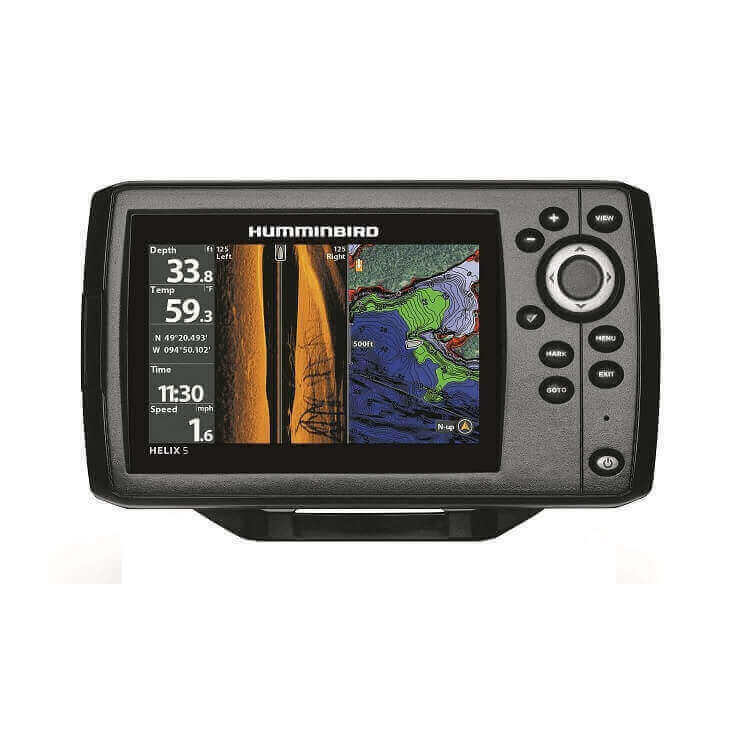 This fishfinder has everything you need to find and land that big one out at the lake or on the river. The fish finder has a built-in Wi-Fi signal to give you the information you need to get your fishing done. The built-in GPS allows you to find your favorite fishing location easily. The Wi-Fi is perfect for those looking for an excellent fishing area without too many fancy gadgets. The fish finder has a dual frequency signal, allowing you to use it in different depths of water. No matter if you’re fishing from the shore or out in the middle of open water, the fish finder allows you to see down into the water. It’s ideal for those wanting a versatile fish finder. The app for the fish finder unlocks everything you need to have a successful fishing trip. You can use the fish activity calendar to plan your fishing trip, and the weather app allows you to track incoming storms. The map function allows you to pinpoint your favorite location, and you can instantly share your photos to social media. You can use the fish finder with your smartphone or tablet to find any fish. Since you don’t need to worry about installing a screen on your boat, you can focus more on fishing. The fish finder works for both Apple iOS and Android products. It’s the best way to utilize your smartphone to have a fun day of fishing. If you’re looking for a sharp image, you’ll love having this fish finder. The fish finder is optically bonded to deliver high-quality colors. The wide viewing angles allow you to find fish hiding just outside of the boat. The unit won’t have any internal fogging, allowing you to rely on this fish finder. You can find just about any U.S. map on the fish finder. It includes lakes, rivers, and coastal maps of the U.S. The transom mount CHIRP transducer can pick up just about any debris in your vicinity. No matter if you’re planning on using it to map the area or find your favorite fish, this is the ideal fish finder. The fish finder runs on a dual-channel sonar, allowing you to fish in shallow and deep water. The CHIRP DownVision sonar produces photo-like images, allowing you to capture just about anything in your vicinity. There is a second CHIRP sonar that targets specific fish, allowing you to adjust your fishing plans. You can live to stream your sonar data straight to your smartphone. You will need to download the app, but it makes it easy to track your location. You can rewind, save, and share your points to social media. Your friends will be jealous when you’re sharing your biggest catch on Facebook. 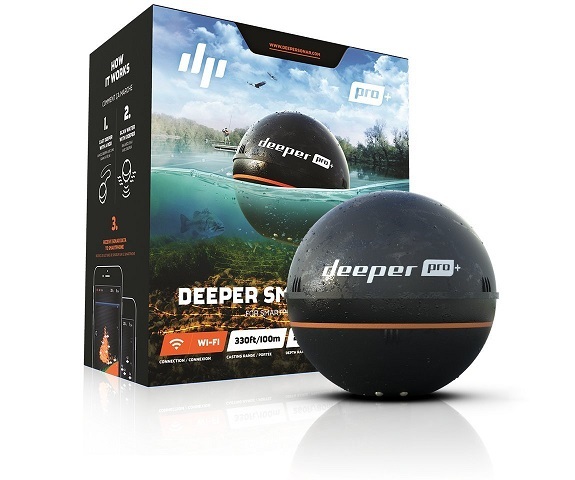 Smartphone users will love this little device, as it provides high quality sonar capabilities in a compact floating package. The Fish-Hunter is a rechargeable floating device that you drop over the side while trolling or when anchored. 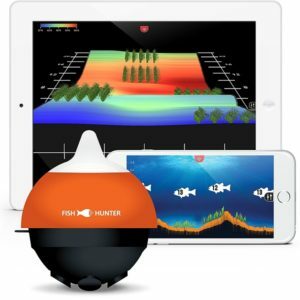 It connects to your mobile smartphone or tablet via Wi-Fi connectivity and relays your fish finder sonar images in full color 3D images to the free app. This is the only 3D wireless sonar of its kind that allows for bathymetric (contour) mapping, 3D fishing images, 3D structure mapping, directional casting, and ice fishing viewing mode all in the same unit. The best feature overall though has to be the sonar transducer: it functions on 5 different frequencies to generate the highest resolution image possible. Better still, this unit can also cover 5 times the area of other wireless portable fish finders. The Fish-Hunter is accurate at depths of up to 160 feet, and even functions for ice fishing excursions at depths up to 100 feet. The Wi-Fi signal range is up to 150 feet, and the unit does not require your mobile device to have mobile network tower access in order to work. This means that you can use it virtually anywhere on a boat, kayak, canoe, from shore, and even when trolling at up to 2 MPH. 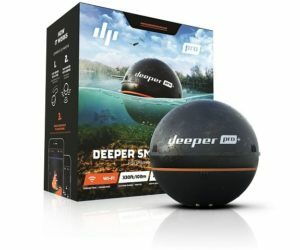 For a mobile fish finder under $300, this is an absolutely amazing value for all of the features and capabilities included. Wireless connectivity with your mobile device for display purposes. 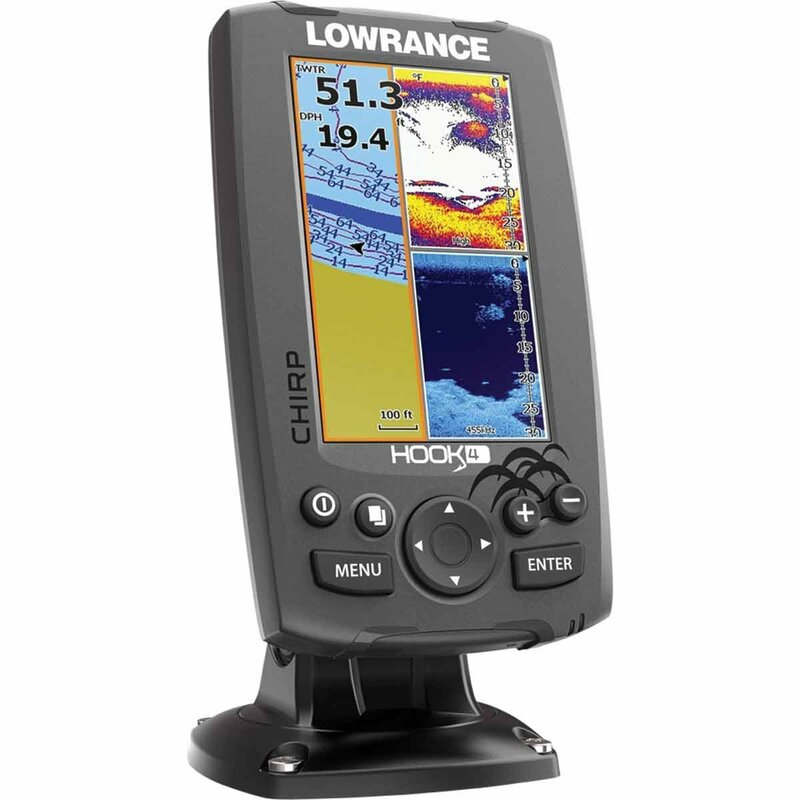 The large screen is ideal for mounting the fish finder on your boat. It has a high-resolution, allowing you to see everything in high-quality detail. You can pick out the type of fish, and look at the contour of the bottom. It’s ideal for those wanting a powerful display to help them on their fishing expedition. The CHIRP sonar includes a down scan, allowing you to pick out more details in the water. When combined with the down scannability of the fish finder, you’ll have a better chance of catching a fish. It provides the best possible view of what’s underneath your boat, giving you a better chance to place your line. The advanced signal processing feature reduces the number of times you need to manually adjust the settings. You can pick out the fish quickly and easily with the advanced signal processing feature. The structure and bottom are shown in clear detail, allowing you to pick out your favorite fishing spot. The fish finder allows you to track back and review your recorded sonar history. You can review the structures, transitions, and fish targets with the look back feature. You can then pinpoint your favorite locations to come back later. It’s ideal for those wanting to use the fish finder on another excursion and wants to come back to the same spot. Moreover, this is the best fish finder under 300. The five-inch color display allows you to pick up more of your surroundings. You can see where the fish are hiding, along with the contour of the bottom of the water. It’s ideal for pinpointing a fish’s hiding location and finding your favorite fishing spot. You’ll love it when you can tell a fish apart from a log or other floating debris in the water. 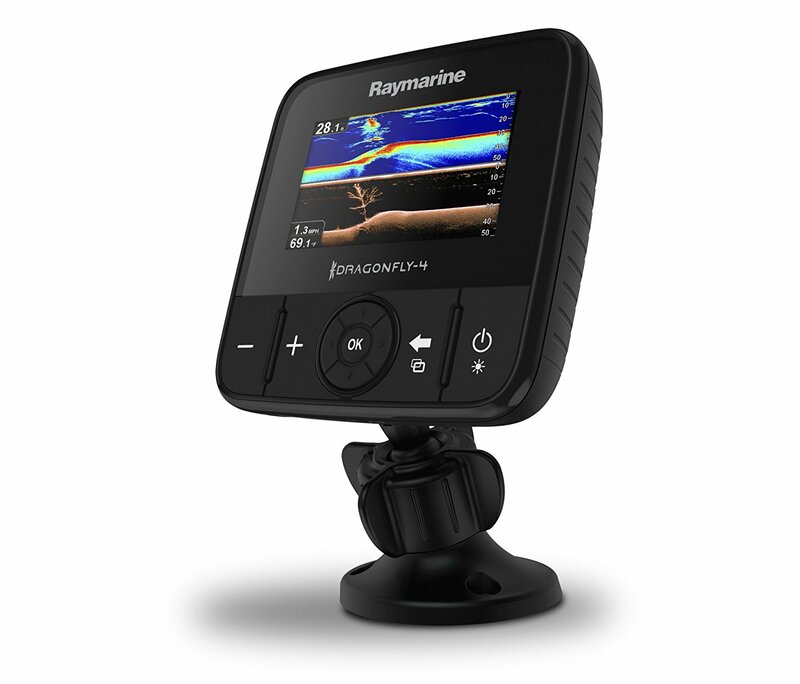 The down imaging sonar allows you to see deeper into the water to locate the fish. Down imaging is one of the most important parts of a best fish finder, which can help you locate the bottom of the water. You won’t need to worry about fish hiding away when you have the down imaging with you. The fish finder operates on dual frequencies, allowing you to use it in shallow and deep water. The sonar picks up every speck of debris, and every movement of the fish to help you catch one. You can rely on the dual frequencies for any part of the water you want to fish. The temperature gauge﻿ informs you of the water temperature. While fishing while temperatures are just right can help you land the fish of your dreams, it’s good information to know. 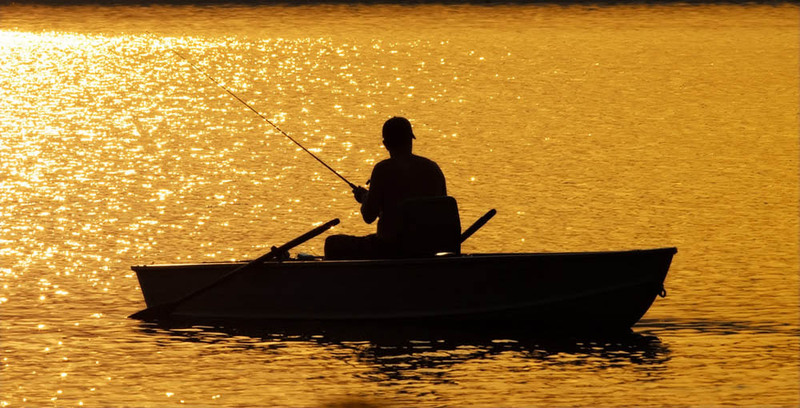 You can adjust your fishing plan to help you catch more fish or the specific fish you want. The frequency range on a fish finder is important to know. When it comes to frequencies, the lower the frequency, the more likely they are reaching deeper into the water. The higher the frequency, the better the fish finder is in shallow water. Some of the best fish finders allow you to change from high to low frequency. If you’re planning on fishing in different areas, you should get a fish finder that can handle multiple frequencies. Fishfinders run off wattage, so finding the right wattage will help you find the right one for you. You want a fish finder that is powerful because it can read the waves and everything under the water to give you a clear picture. The combination of wattage and power allows you to see down further into the water. For example, using a fish finder with 100W at 50kHz allows you to see down to 450 feet under the surface. Depending on how many pixels you get, the resolution may or may not be as clear. For the minimum number of pixels, you should get a fish finder at 240 x 160 pixels. While this is the minimum you want, you should be able to find one that works better than that. You can find the screen resolution on the product, allowing you to make the right choice for you. The transducer is what sends and receives information from under the surface. You can install a transducer on your boat, and some of them have kits to help install them. When the information is sent back to the transducer, the sonar is sent to the screen. This is how you can see what’s under the water. You can pick up just about anything when you have the proper transducer for you. While most fish finders have color screens, you can find some that still use a black and white feature. Depending on your preference, you can find the right screen for you. Color screens are ideal for picking out the fish and the debris in your location. Most color screens can display over 250 colors, allowing you to pick out everything easily. When you combine the right transducer with the screen, you can easily pick out what is debris and where the fish are. Color screens provide the best chance of catching a fish since you can tell where they are located. Who Needs the Fish Finder and Why You Need It? Anyone who loves fishing will appreciate a fish finder. They are easy to use and provide you with the best information possible. Not only can you learn a lot about the contours of the bottom of the water, but you can also map out your location. They’re ideal for anyone who loves the outdoors and wants to get a better idea of their surroundings. A fish finder is an excellent tool that can help you track fish. Not only can you track the fish, but you can also use the fish finder to find your favorite spots. You can always come back to it later. A fish finder provides the excellent information you’ll need to help you have a successful fishing ﻿﻿trip. Fish finders are ideal for those wanting to get more information about their favorite fishing spot. If you’re a fisherman or kayaker, a fish finder makes a lot of sense. There are plenty of fish finders available, but you should find one that best suits you and your needs. If you’re thinking about getting a fish finder, the HELIX 5 CHIRP is an excellent choice. You can see more underneath the water with this fish finder than you will with others. For less than 300, you can’t get much better than this one. Whether a good fish finder can be a great asset for finding fishes with helping to locate fish. The increased amount of money can be a problem. I think the 300 margin is good enough to spend for finding proper fishes. Thanks for the information and guidance. I am looking to be able to move the fish finder from one boat to another. 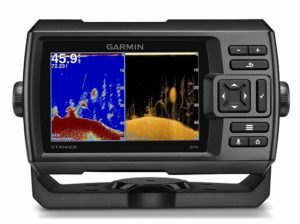 Is the Garmin Striker set up so a person could unplug the transducer and power… and purchase another transducer and power supply to install in the second boat? If not, do any of these have that option? Yes, You can use existing one.